Discovering you’ve got a dead car battery after turning your key in the ignition and hearing nary a click from the starter is a frustrating experience. Luckily, there are many ways to get the juice back into your vehicle: booster pack, battery charger, etc… Though which one to choose depends on the situation. Check out the following tips to learn how to safely recharge your car’s battery. How dead is the battery? It’s important to know just how dead your car’s battery is before you decide how to recharge it. A healthy battery will show 12.4 to 12.7 volts across both terminals when measured with a voltmeter, a handy device for diagnosing battery issues. If the voltmeter reads lower than 12.4 volts, you’ll likely run into problems when trying to start your vehicle. How much lower will determine what method you should use to charge the battery after jump-starting your vehicle. In general, if the battery is showing between 12 and 12.4 volts, it’s safe to recharge it using your vehicle’s alternator. That means driving around using as little electricity as possible—stereo system off, lights off (don’t try this at night), and all heating and cooling functions off—to make sure that the alternator is sending as much energy into the battery as possible. You’ll also want to keep your vehicle above idle as much as possible, as higher revolutions will pour more power into the charging circuit. Aim for at least a 30‑minute drive to get the battery back to a safe level for your next start. 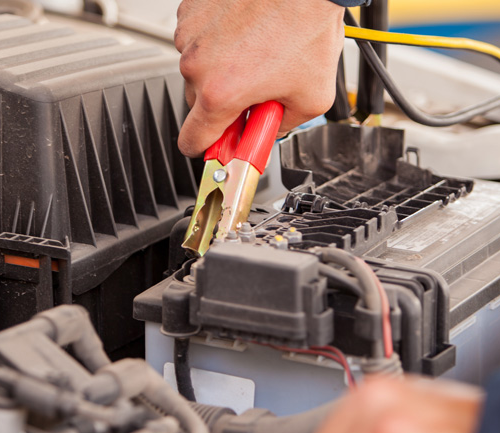 A car battery is considered discharged when the voltage drops below 12 volts. While your vehicle’s alternator can keep a healthy battery charged, it was never designed to completely recharge a dead unit. Using it to try to restore such a depleted battery can actually damage the alternator, which is forced to work overtime to both fill up the battery and supply energy to the rest of the vehicle. You can also hurt the battery by undercharging it this way, making it less likely to keep the charge that the alternator puts into it. 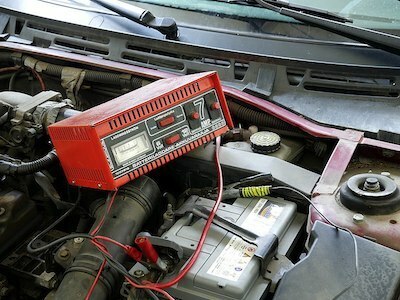 With a seriously depleted battery, your best option is to connect it to a jump starter or a dedicated battery charger either before or immediately after a jump-start. These charging devices are designed to safely restore a dead battery to full charge. Most of the time, you don’t even have to remove the battery from your vehicle. Don’t take chances with your battery. Using the right recharge method will extend its life and ensure you never get stranded again. Visit NAPACanada.com to browse our full range of electrical system products, or drop by one of our 650 NAPA AUTOPRO Service Centres for routine maintenance and repairs. For more information on how to recharge a dead car battery, speak to an expert at your local NAPA Auto Parts store.